Traveling is a great to experience different and exciting things, connect with new cultures, learn, expand our horizons, meet new people, and know ourselves better. There’s countless benefits to be gained from traveling and all those benefits truly make traveling a wonderful investment. The following resources will help you along with your journey of traveling. I’ve provided links to each of the resources website for you. Use these resources to plan your trips, get the best deals possible, make a travel budget, and more. Bookmark or save this page in your favorites to refer back to. Download Our FREE “Travel Budget Worksheet”! It’s important to know what your travel budget is before you even begin planning your trip. For some people it’s tough to even start a travel budget or they don’t know how. To make it easier for you, I’ve created a “Travel Budget Worksheet” that you can download for free! The worksheet is a template that you simply fill in after you download it. 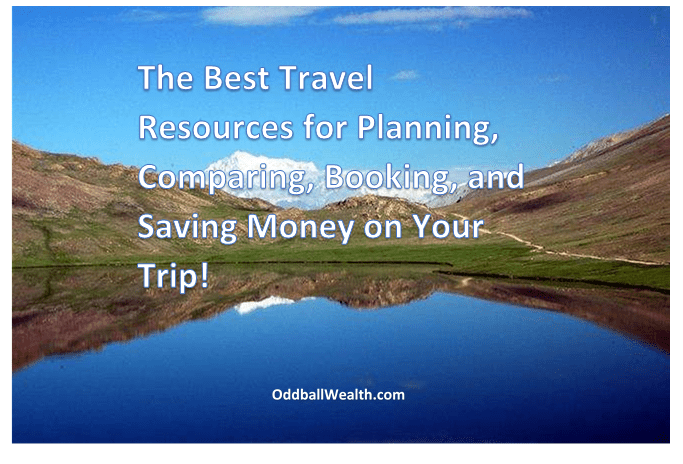 It’ll give you a better understanding how much money you can afford to spend and how much money you actually end up spending on your trip. Download Our FREE “Travel Budget Worksheet” by Clicking the Link Below! Full-service websites allow you to view customer reviews, compare rates to find the absolute best deals, and book your entire trip all at once. You’ll be able to book the best rates on hotels, airline tickets, car rentals, vacation packages, cruises, restaurants, and more. Priceline.com. Book and compare rates on hotels, airline tickets, car rentals, vacation packages, and more. Hotwire.com. Book and compare rates on hotel, rental cars, and airfare. OneTravel.com. Book and compare rates on flights, hotels, rental cars, vacation packages, cruises, and business class flights. AboutAirportParking.com. This is a wonderful service that’ll save you time and money! It lets you comparison shop airport parking lots, and find & reserve a space for almost always less than the drive-up price. It’s always a good idea to protect yourself when traveling by having some type of insurance, especially when traveling to foreign countries and overseas. The unexpected can and will happen, and not having any insurance to protect yourself will not only ruin trip but it’ll also be expensive. It’s always a good idea to have travel insurance anytime you travel. It’s especially important if you’re leaving the country to travel to foreign countries or overseas! Travelexinsurance.com. Travelex offers travel insurance that can cover unexpected things like flight delays, trip cancellations, lost or stolen luggage, medical expenses, and emergency transportation whether you’re traveling domestically or overseas. They also provide you with 24-hour travel assistance and concierge services giving you less worry and more enjoyment from your trip. AllianzTravelInsurance.com. Allianz is the leader in the travel insurance industry. Providing insurance and travel assistance to millions of travelers each year. Allianz Global Assistance program allows you to enjoy your trip much more knowing that they cover non-refundable financial expenses due to a interrupted or cancelled trip, or medical emergencies, lost baggage and more. When you book your hotel, ensure you’re getting the best hotel rate possible by comparing the rates of competitors. Read the reviews on each hotel to make sure it has good customer service and clean rooms. Some vacations are meant to be more than just staying in a hotel room. Whether it’s for the greater privacy and relaxation, space, or nicer amenities that a vacation home offers. Renting a vacation home can be very affordable and really add to the enjoyment of your trip. TripAdvisor.com. TripAdvisor lets you search for vacation homes in 190 different counties! So you’ll be sure to find the perfect property where ever you go. You can search for full home rentals, villas, beach rentals, cottages, or cabins. You should try to stretch your budget as far as possible to save money, which is why it’s important to get the best deal when renting a vehicle. Compare and save! Dinning out can be expensive. Make sure you get the best deal possible and the restaurant has good reviews before you go. Do this by checking TripAdvisor.com. Go to TripAdvisor and click on the “restaurant” tab to find the best restaurants and deals. Find deals on cruise at Priceline.com and OneTravel.com.